The majority of the chairs set out for an early morning public hearing on Tuesday morning sat empty as Mike McKippip, Project Analyst for Healthcare Planning and Certificate of Need Section for the North Carolina Department of Health and Human Services called the meeting to order. The purpose of the meeting was to solicit public comment and questions on a potential site for a new location for Angel Medical Center as required in AMC’s Certificate of Need application submitted to the state. 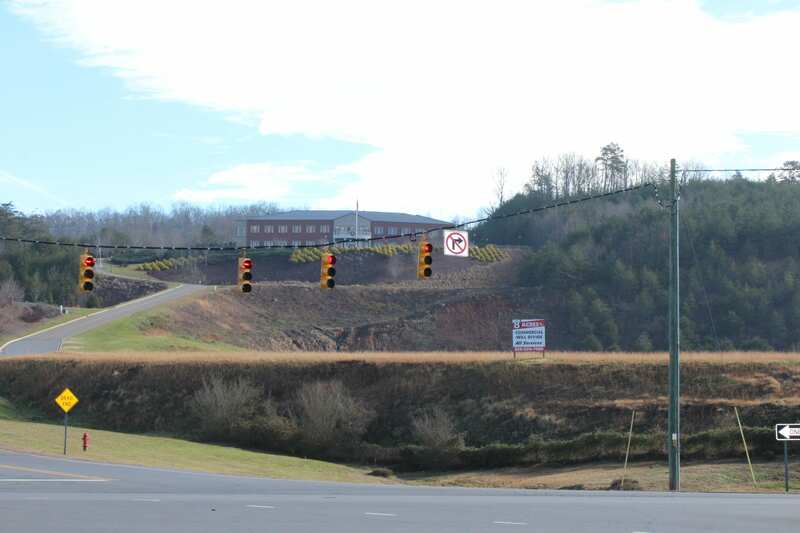 The proposal including building a new facility at the intersection of 441 and Hunnicut Lane in Franklin. The majority of those in attendance were employees of Mission Health Systems. The dozen or so others attending the public comment were comprised of county employees, town employees, or members of a town or county board such as the Economic Development Board or the Franklin Town Planning Board. Karen Gorby, president and CNO at Angel Medical Center said during her prepared remarks at the meeting that the new facility will come with a $46 million price tag and will include the 25 beds required to remain a critical access hospital. Gorby stressed the need for the new facility based on the financial benefit for Mission. According to Gorby, Mission considered three options. The first being to continue at Angel Medical Center the way it is, which she said was not possible due to the hospital not providing the level of care necessary to serve the community. The second option was to renovate the existing facility, which was built in 1955 and expanded in 1974. According to Gorby, that option was taken off the table because it would be too time consuming and expensive for Mission Health Systems. The third option was to build a new facility on a new site, which Gorby described as the most cost effective and efficient. According to Gorby, it would cost $46 million to build a new hospital and $52 million to renovate the existing one to meet state and national standards. Jane Kimsey, chair of the Angel Medical Center Board of Directors spoke in support of the project. Kathy Guyette, Senior Vice President of Patient Care Services for Mission Health Systems said that while the proposed facility is smaller than the current Angel Medical Center, the new facility will have a larger Emergency Room, larger patient rooms, and easier access for the public. Guyette also assured those gathered that even though the facility will be smaller, no services will be eliminated at the new facility and any and all services currently provided at Angel Medical Center will continue to be provided at the new hospital location. The only two people to speak at the meeting who were not Mission employees were Macon County Emergency Management Director, Warren Cabe and Todd Doster, Macon County EMS Coordinator. Both spoke in favor of the new facility and the proposed location, saying it would make transporting patients easier. “If this is the plan Mission has for the new hospital, then we support this,” Cabe said of the information provided at the meeting. Cabe made it clear that he was not speaking on behalf of Macon County government, but rather on the department he represents. While the hospital will have 25 acute care rooms, Franklin said the new facility will have specialty rooms for behavior health and isolation. As of now, the plan would be to receive approval from the state in March 2018 and according to Franklin, with the new facility to be completed by late 2022 or early 2023. The Certificate of Need Public Notice announcement said the hospital would be completed by October 2021. The public notice failed to name the “agency” in which comments were being solicited for and due to (Healthcare Planning and Certificate of Need Section) or the actual location of the meeting (Robert C. Carpenter Community Building). Truitt said that if the CON to build the hospital is approved, Mission Health Systems will be holding community forums to solicit feedback on the new facility design, furnishings to include and the look of the facility. The notice placed on the state website does feature more information, but doesn’t meet the legal requirements in North Carolina of a public notice. North Carolina General Statute regulating public hearing notice requirements states that the notice must be published in two successive calendar weeks at least 10 days before and not more than 25 days before the scheduled hearing. The notice published in The Franklin Press ran 41 days before the public hearing and only ran once. Cobey Culton, Press Assistant for the Office of Communications of the North Carolina Department of Health and Human Services, however, said the CON hearing didn’t meet the public meeting requirements. The NC Department of Health and Human Services requires that a Certificate of need public comment period be allowed during the first 30 days of the review period. The public notice, which ran on Nov. 8, eight days after the published date of November 1, already started, said public comment would end on December 1. While the process started on Nov. 1, the public’s first notification of the process was not until Nov. 8, a week into the public comment period time allowance. The statute also states that “a public hearing is required to be conducted by the CON Section in the service area affected by the application no more than 20 days from the conclusion of the written comment period.” The public hearing held on Tuesday was one day prior to that deadline. The public hearing was scheduled on Nov. 1 to reserve the room at the Macon County Community Building. Mission Health Systems did send out a press release on Nov. 1, the same day the room was reserved announcing the potential new site for Angel Medical Center, but did not mention anything about a public hearing being scheduled for the site. County officials including Macon County Manager Derek Roland and Macon County Commission Vice-Chair Ronnie Beale both indicated they were not aware of the scheduled meeting. Town officials were also not aware of the meeting. Despite Franklin and Macon County leaders requesting a sit down with Mission Health Officials about the closing of the Labor and Delivery, Mission never scheduled such a meeting. A small group of 12 specifically selected citizens were granted a meeting with Dr. Paulus, but that meeting was limited to those 12 people and no members of the media. If the Certificate of Need is granted by the state, Mission Health System will have to go through a special use process before they can start construction on the proposed property. That will include a neighborhood compatibility meeting and a public hearing with the Franklin Town Council, which will include the Town mailing letters to everyone with 400 feet of said property line and be notified by signs on the property and in the press at least 25 days but not less than 10 days before for each hearing.